The Municipality of Antiparos launches the Structured Public Consultation Mechanism for proposals and ideas to be implemented, in the context of shaping and highlighting in a participatory way its needs and priorities in terms of municipal projects and actions. The Consultation Mechanism is provided to the public through a modern digital tool, the online platform that is accessible at the link http://hello.crowdapps.net/participation-antiparos/. 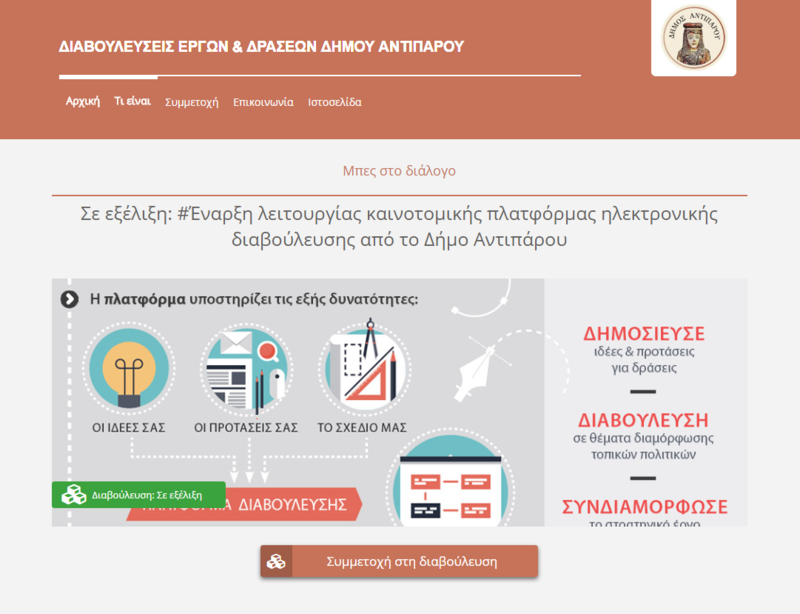 Crowdpolicy, a pioneering company in matters of open – participatory government and open data technologies, has designed, developed and implemented the Online Consultation Platform for the Municipality of Antiparos. For more information, please visit https://crowdpolicy.com/.